We have uploaded the Recruitment Notification. 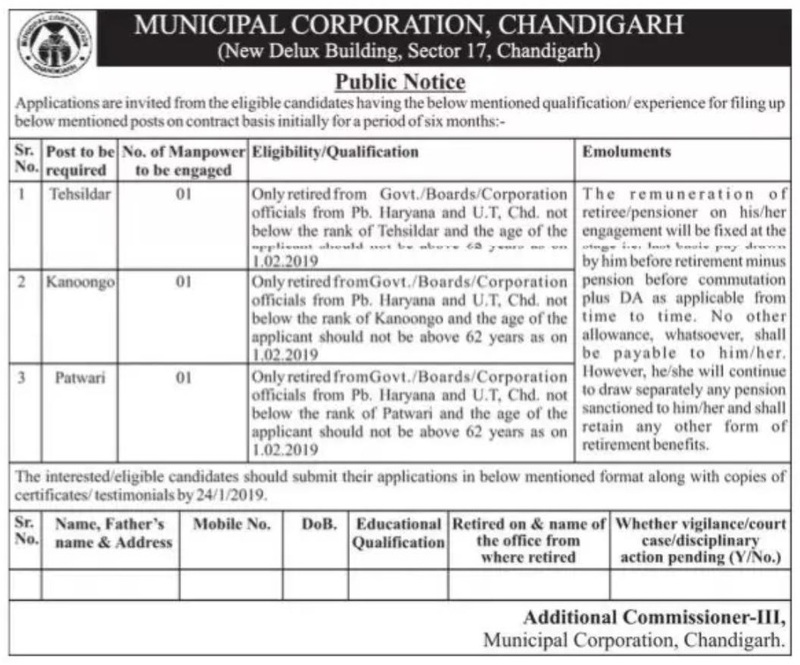 The applicant can read the official thoroughly before filling the online application form for Municipal Corporation Chandigarh Recruitment 2019. Applicants can fill their online forms until 24th January 2019. Furthermore, complete details link education, age limit, selection process etc are given below. Educational Qualification:- Candidates who are going to apply for Municipal Corp Chandigarh 2019 Application Form, their minimum education should be retired from State/Board/Govt from the similar post. For more details, candidates may download official notification for more details. Age Limit:- Candidate’s age should less than 62 years per official notification. Moreover, age relaxation for SC/ST/OBC will permissible according to govt norms. Salary/ Pay Scale: Salary or pay scale will be admissible as per state government rules. Eligible and interested candidates may submit their application form on plain paper along with attested copies of their document such as educational qualification, proof of date of birth, experience certificate and passport size photograph. Application complete in all respects should reach the office of Municipal Corporation, Chandigarh before 24th January 2019. Incomplete applications or those received online & through email will be rejected forthwith.